hmm...i dont see anything on the mopar performance website. this is an odd situation, i think...before the new pipes went in, were you having a problem at all? if not, i would think that the gasket surface on the new pipes is somehow irregular. what type of material are the gaskets which are you using made out of? lots of companies make "high performance" collector gaskets, but they are usually for headers. do you know he inside diameter and the bolt pattern? if youre having problems, i would recommend a copper collector gasket, but ive not had manifolds for so long, ill need as much info as you can provide before i can advise properly. also, once i find out exactly what you need, i can check to see if mopar offers a performance set, and i may be able to get you a better price..let me know. The bolt pattern on the manifold is "4 center to center, "2 1/4 diameter pipe, gasket hole is "2 1/2. looks like extruded metal with gasket impregnated into it. pipes were fabricated by a muffler shop using a coded bendind machine. I even tried putting an exhaust doughnut in side with the gasket and it blows out.checked mufflers and pipes for restriction, both are straight through. I think I remember seeing a double cone doughnut somewhere but have not located one yet. Thanks for your quick response. its a four bolt pattern? so something like this, will not work, right? or is it the same pattern? 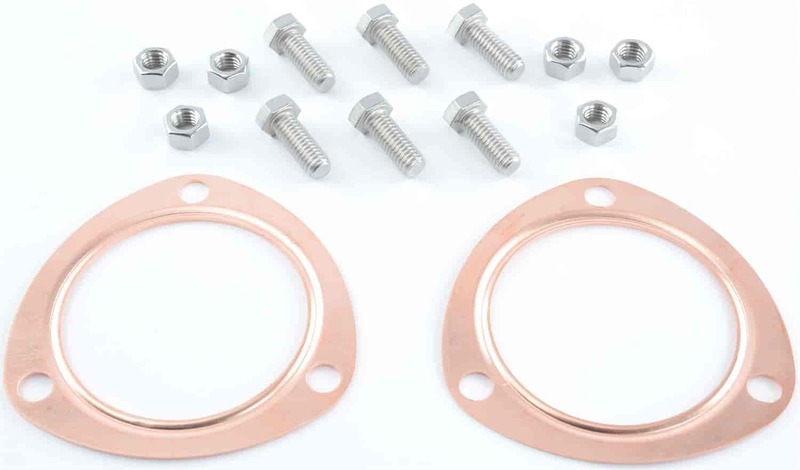 youre looking around 10 bucks for the set, which is both gaskets, and 6 stainless bolts and lock nuts. i asked a mopar parts guy whom i know, and he doesnt think that mopar makes their own high performance gasket..
hmmm..a performance 2-bolt gasket seems to be more illusive. but these are NOT full copper gaskets. a few more questions, is it burning them on both sides (both manifolds), or just one? Another thing, are you certain that they are tight enough? I have seen cases where the aftermarket gasket surfaces were thinner than original, and the studs/bolts and nuts were made to be tightened to a certain point, and when tightened down, they were bottoming out and not getting a good seal. Also, if you are tightening them TOO much, and you are crushing the gasket, it could also create a weak point. When you put the gaskets in, have you tried putting a thin bead of silicone "gasket in a can" around both sides first? Havent had any luck finding anything but the felpro type gaskets, Im going to put them in with some high heat silicone and torq to 35 FT LB. They are burning the paper material off the metal and leaking. Plugs look good so it is not overly high cumbustion heat. always the passenger side. thanks for your replies. crossing my fingers. if its only the passenger side, it has to be something with the new pipes, if it wasnt doing it prior...have you inquired about it with the place that made the pipes? Up date. Removed manifolds and checked surface, discovered that the exh pipe flange which is welded onto the pipe a little lower than flush (pipe sticks through flange) has slotted holes which allowed the metal ring in the gasket to seat on the pipe instead of around it, this would not let the flange tighten up against the manifold and would blow out. put new gaskets onto pipe with high heat silicone and then installed. so far so good. It was just so tight in there I could not see what was going on with out removing mainfolds. Thank you for your replies. Looks good now, fresh eastwood on manifolds & everything. Does the exhaust need mods?? Trak Pak - Different Exhaust?